The full video is available from the Frontline Website. A must watch in my book. Interesting to note that many of the experts on the interviews are made up of the new left/center-left security outfits (e.g. CNAS) who are going to make up a lot of the mid level positions in an Obama administration. Also a bunch of COIN guys (Nagl, Kilcullen). There is so much to comment on, but the section (towards the middle) on Pakistan is the key portion in my book. The prior colonials have never been able to hold Afghanistan (Alexander the Great, British, Soviets) because they could not deal with the tribal Pashtuns lands in FATA. That sanctuary allows an on-going insurgency. This to me is exactly the same and I’m not sure I see a way around that fact. I’m not as concerned as some of the interviewers (e.g. Colin Kahl) that Pakistan is teetering on the edge of total collapse. They are facing some serious threats–both financial and military. But I don’t get the sense that the Pakistani Taliban want to overrun the Pakistani state. They just want to be left to rule themselves I think. They have launched a series of attacks on the Pakistani state and civilian population in response to periodic incursions by the Pakistani military into the tribal areas. As Robert Kaplan notes, the Pakistani army is not built for such fighting–it is built for a conventional state war against India. When Hussein Haqqani comes out at the end and says that the new Pakistani government of Zardari and Gilani sees the Pakistani Taliban (as did Bhutto) as an existential threat, that position is one of those elites and not necessarily of the Army, nor the ISI, nor perhaps the bullk of the population who I sense are anti-Taliban in the sense that they obviously don’t want to be ruled by the Taliban but not in favor of what they see as the US War on Terror. The airstrikes into Pakistani territory don’t help in this regard. The COIN Doctrine of winning hearts and minds is a particularly tough one, and I’m pessimistic that it can ever work at all. But certainly after the initial opportunity has been missed 6 years too late in the Afghanistan context and 3 years too late in Iraq when the surge came into existence. The best it seems it can do at this point, in my opinion, is not make it all out civil war when one leaves. But the state will be for a long time to come dysfunctional if not essentially hollowed out. Eventually the Afghan Taliban are going to be part of the Afghanistan government. There will have to be an amnesty, allowing them to join the National Army, etc. But the Afghan Taliban are not centralized and controlled by Mullah Omar any longer. Moreover, with the loss of the Taliban police state, the Taliban have now had to join up with criminal gangs, poppy growers, narco-traders, etc. So even some attempt as Petraeus wants to do to separate the reconcilables from the unreconilables, which I agree is as smart a policy as can be done (and could do some objective good), with the fragmenting of these groups, such a policy as in Iraq post-surge may just be more a recognition of the basically failed state status/fragmentation of the country and work to undermine whatever state power is left (again as in Iraq with the Awakening Councils). The Afghan Taliban at the end of the day and even a Pakistani Taliban that is not seeking to overthrow the Pakistani government are not threats to US national security. The potential of failed/hollowed out states wherein trans-national terrorists can hang out, train, and launch attacks is. [Not an existential threat unless we overreact to another terrorist attack like we did the first one–but a legitimate threat nonetheless]. But I’m not sure how those two get separated. There are rumors like Mullah Omar will split with al-Qaeda (h/t Attackerman), but others could pick up the slack (Jalalludin Haqqani, Beitullah Mehsud in North and South Waziristan respectively). What is clear is that as long as there are foreign troops in Afghanistan there will be a jihad. As long as the Pashtuns (and their new Pashtun-reps the Taliban) are not part of the government, then the jihad will also be against the Afghan Army. As well as on the other side, the Pakistani state/army/civilians. The tribal lands are the hardest nut to crack. One of my favorite bloggers with a long, detailed, and brilliant piece that is a must read. The United States and NATO can’t be driven from Afghanistan militarily. Nor, however, can the Taliban be crushed in the foreseeable future. The US is going to be in Afghanistan for years to come. The only thing that’s going to change in Afghanistan is the objectives. General Petraeus as new head of CentCom along with Robert Gates (will he or won’t he stay on as SecDef under Prez Obama?) are working on major reviews of all strategy from Iraq & Iran to Afghanistan and Pakistan. The central core of which will be a call to begin negotiations with the Taliban. Obama has actually had a quite hawkish hardline stance on the Taliban, so this will get interesting. The idea will be to buy off and separate as many of the elements of the insurgency as possible, and see if possible to break the Taliban from al-Qaeda. There are a couple of problems with this theory however as I see it. One, the Mullah Omar wing of the Taliban will never sell out bin Laden. If they wouldn’t before the war, why now? They are neo-fundamentalists in Olivier Roy’s terminology meaning they are interested in creating Islamic society not an Islamic state (they were very uninterested in actual governance when in power in the 90s). Now the newer Taliban or Pashto insurgent groups in the south of Afghanistan can be dealt with it seems to me and realize they will have to get along with the Afghan Army. But they will be seeking a withdrawal of all foreign troops in order to facilitate a stand down. Plus, they have no real connection with al-Qaeda who is off in Waziristan. Petraeus, as China Hand remind us, is a genius of the media age and has at times shown a unwillingness to bend to civilian rule. The current batch of leaks to US media and from European allies is undoubtedly not accidental. Ultimately the Taliban do not pose a threat to the domestic security of NATO countries nor to the international order. They could become a FARC-like naro-terrorist group that will wreak havoc locally and/or a return to a brutal dictatorship but how is that different than say Burma? It appears that the key job before General Petraeus will be to co-opt the regional impetus toward a negotiated settlement, prevent Saudi Arabia from mid-wifing a power-sharing arrangement favorable to the Taliban, assert American control and direction over the process to assure America’s continued presence at the center of Afghan’s security equation, and spike the loose cannons that threaten his plan. Even if NATO, the central Afghan authority, and the Afghan Taliban get on the same page, there is still the question of how much collateral damage to tolerate—or provoke—in Pakistan. In Pakistan, the same as Afghanistan. The Taliban, what we are calling the Taliban, is actually a series of global guerrilla groups–cellular, fragmented, networked, with fluid membership. Some attack traditional tribal leaders, some don’t. Some play by the old tribal customs, some are increasingly bucking them. So a peace deal can definitely be made with some no doubt, but there is no one person–not even Mullah Omar–who has control over the movement and therefore can sign some treaty and end the conflict of all these various groups. Particularly when so many fund their operations through crime (drug trade, kidnappings, smuggling, etc.). What this still leaves open as a question that dare not speak its name in US foreign policy discussion is: how much of a threat really is al-Qaeda? The Pakistanis don’t see the Pakistani Taliban as an existential threat. There really is no proof that the Pakistani Taliban want to take over the government. They basically want to be left alone to create their own idealized Islamic society in Waziristan. The problem then is the continued hospitality/safe haven given AQ and its leadership in the Pakistani FATA region. But why would they gain from selling out AQ? What do they have to fear except some predator drones really at the end of the day? No one will have this discussion it seems to me, but we need to ask how effective is all of this? How worth it is this attempt to get AQ? I’m not disrespecting the enormity of 3,000 civilian casualties inside the US, but AQ is predicated on more and more spectacular attacks and luring the US into Muslim countries around the world (by rasing the flag of AQ as bin Laden said–often as a decoy mind you) and bleeding the US dry. Their weakness is the need for spectacular attacks and how difficult it is to pull off one always greater than the last one. Particularly post September 11th. But Obama is a Democrat and won’t be able to face any possible criticism of weakness, so he is going to charge in there and we’ll continue to muddy along I suppose for some time to come. Behind (for now) a government firewall, but what’s leaked isn’t good. NyTimes on the report. A draft report by American intelligence agencies concludes that Afghanistan is in a “downward spiral” and casts serious doubt on the ability of the Afghan government to stem the rise in the Taliban’s influence there, according to American officials familiar with the document…Its conclusions represent a harsh verdict on decision-making in the Bush administration, which in the months after the Sept. 11, 2001, attacks made Afghanistan the central focus of a global campaign against terrorism. The Afghan Army apparently is getting better, but the opium trade has exploded of course, rampant corruption in the government. And by corruption we should say that is a Western judgment–fair within those parameters but not so much outside of them. What is typically called corruption in the Western press is what Edward Luttwak called “family-ism”–i.e. people using their jobs to get a cut to protect their families. The administration is considering whether the United States should devote more effort to working directly with tribal leaders in far-flung provinces, and possibly arming tribal militias, to fight the Taliban in places where Afghanistan’s army and police forces have been ineffective. The Bush administration had long resisted making tribal elders a centerpiece of American strategy in Afghanistan. American officials had hoped instead that strong national institutions like the Afghan Army could protect the Afghan population, but the escalating violence this year has forced a reassessment of the value of the tribal system for counterinsurgency operations. That’s McCain’s idea of the application of the SURGE (“Feel The Surge!! !”) to Afghanistan. There have been some over-reaches by the Taliban in certain quarters of the tribal areas. Other places they are protected under tribal rules. In the places where there has been violence by Taliban against indigenous tribes that generally has been on the Pakistani side and is a product of lower classes rising up (under the banner of Talibanism) against entrenched local elites. I’m not sure further weaponizing an area already awash in guns is an especially smart idea. (KABUL, Afghanistan) — Pakistani troops fired at American reconnaissance helicopters patrolling the Afghan-Pakistan border Thursday, heightening tensions as U.S. steps up cross-border operations in a region known as a haven for Taliban and al-Qaida militants. The Pakistani army has put a message that their troops have orders not to fire. That could be interpreted as simply grandstanding and a wink-wink deal behind closed doors where the Pakistani leadership has signed off on US/NATO incursions (if only aerial) into their land. But it again makes clear that Pakistan is only interested in this fight insofar as it involves al-Qaeda and the Pakistani Taliban attacking their country. They have no real care or interest in Taliban roaming across the NWFP into Afghanistan and launching attacks against either the Afghan Army/Police or NATO. That simply doesn’t matter to Pakistan. Pakistan wants the Taliban or a Taliban-like (Pashtun dominated) government in Afghanistan. Always has, always will. The Pakistanis also know that increased US pressure in the tribal regions, pushes the insurgency/terrorism against them. If NATO/US gets better at preventing cross-border raids from Pakistan into Afghanistan (i.e. West), that energy-violence has nowhere to go but back into the heartland of Pakistan (i.e. East). It’s the foreign policy equivalent of the financial meltdown. Two helicopters carrying coalition forces landed in a Pakistani village in South Waziristan near the border with Afghanistan in the early hours of Wednesday morning and the soldiers opened fire on villagers, killing seven people, according to a spokesman for the Pakistani military. The account by the spokesman, Maj. Gen. Athar Abbas, broadcast on Pakistani television on Wednesday evening, described what appeared to be a first commando attack by NATO forces against the Taliban inside Pakistan. Under normal circumstances, that would typically be labeled as an act of war. In unusually large and well coordinated operations in eastern Afghanistan Monday, Taliban fighters killed 10 French soldiers and at least six suicide bombers attacked a base of NATO alliance troops, NATO and Afghan officials said Tuesday. The fighting with the French began late Monday afternoon when dozens of insurgents ambushed a French-led patrol near the town of Sarobi about 40 miles east of Kabul, according to NATO officials. Shortly after the ambush, a quick reaction force of NATO and Afghan soldiers and air support was sent to reinforce the French patrol. Taliban fighters forced Pakistani soldiers to retreat from a militant stronghold near the border with Afghanistan over the weekend, after a three-day battle sent civilians fleeing from government airstrikes. The pullback from Bajaur, an area of Pakistan’s tribal region where the Taliban and al Qaeda have forged particularly close ties, came after the military launched an offensive there late last week. Read the rest of the piece for a clear detailed account of the tactics of the Taliban. [A defensive hedgehog, followed by attacks on enemy convoys, lay IEDs/mines along transport rodes, then swarm manuevers when the enemy has to divert (in order to avoid IEDs). Pakistan’s ruling coalition announced plans Thursday to seek the impeachment of President Pervez Musharraf, alleging the U.S.-backed former general had “eroded the trust of the nation” during his eight years in power. The new governing coalition is having trouble getting its act together. It has not reinstated the deposed justices (deposed/arrested by Musharraf) a pledge they made during their campaign, they had an aborted and amateurish attempt to gain control over the ISI, and are taking serious heat from the US for their position on negotiating with Taliban in the Tribal Areas. So the push for impeachment of Musharraf probably plays well domestically I suppose and has the potential of re-solidifying the already fracturing democratic coalition. But whether impeached or not, Musharraf is essentially powerless–he is no longer head of the military (that position belongs to Gen. Kiyani) and the civilian elected government is moving on its own terms (US visits, Taliban negotiations, etc.). Very harrowing story of new terror-related attacks on Kabul via Newsweek. 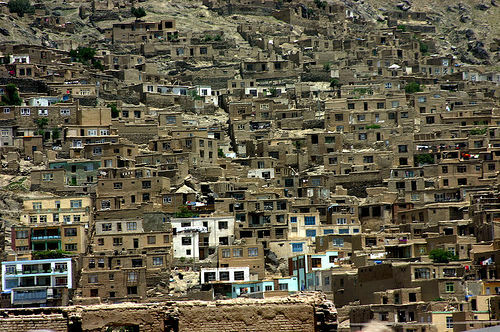 Photo of Kabul hillside from poster Zedwards on Flickr under Creative Commons License.